Labor Day weekend, a celebration of hard work and a time for families to picnic, go to the beach and spend time outside before the cold winter begins to set in. What it really means is an end to summer trading conditions and the onset of real trading. Labor Day marks the end of summer, the time when the big money managers and institutional investors come back from their summer holidays, and market volume returns in force. The question now is, what will those big money managers do when they get back to work? The US markets are at or approaching all-time highs, will the big money, the smart money, sell to lock in profits or will they buy. Based on what I see I think they will buy and here are three reasons why. Economics – US economic data is robust. The second quarter GDP was revised up to 4.2% and outlook for the 3rd and 4th quarter are even better. Based on the GDPNow tool from the Atlanta Federal Reserve we can expect to see quarterly GDP above 4.0%, possibly as high as 4.5%, until the end of the year. This growth is fueled by business investment, manufacturing activity, expanding labor markets, rising wages and consumption which all show no signs of abatement. To the contrary, the Index of Leading Indicators has been positive for 2 years and indicates expanding growth over the next 6 months. No reason to think the market will have a massive sell-off. Earnings – US corporate earnings outlook is robust. We’ve just come off a great quarter with near 25% earnings growth and that is expected for the next quarter as well. The following quarter, the 4th, will see growth decelerate to about 17% but I think that estimate is low. Based on my assessment of labor market conditions, wage growth and consumption I think this holiday season could be much better than we’ve seen in many, many years and that will drive earnings. Beyond that next year is supposed to average 10.3% which is still quite good. No reason to sell stocks here folks, move along, move along. Trade – The US is engaged in a global trade squeeze in which the goal is reduced tariffs and free trade around the world. The so-called trade war reached its darkest days over the summer but bug steps have been made since. The EU has pledged to work towards freer trade (no real moves yet) but the big story is NAFTA. NAFTA has been a sticking point for over a year as negotiations drug on. In the last week Mexico and the US reached a deal in principle that allowed the inclusion of Canada, once the trilateral agreement is reached it will send a signal to the rest of the world. Get together with trade or get left out. Regardless, we’re on the upswing regarding the trade war and that will provide additional tailwinds to economic activity and corporate earnings. If China comes to the table and makes real concessions it will be the biggest catalyst the market has ever seen. What should you do next week? 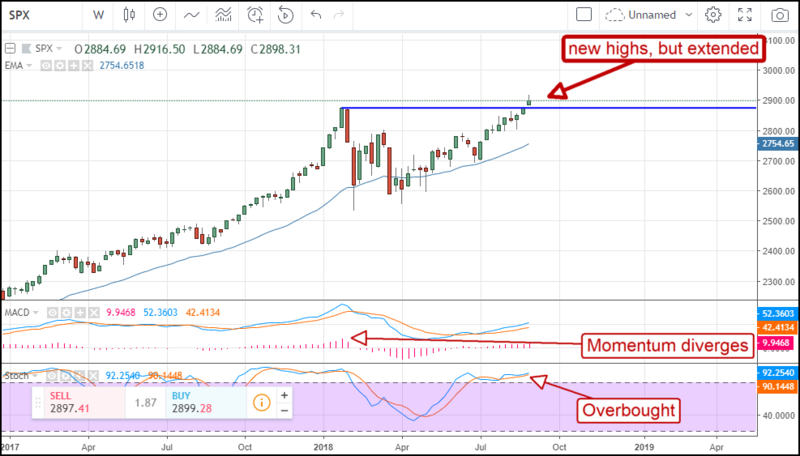 Get ready to ride a major rally that will last into the end of the year, maybe beyond. Next week we will likely see some volatility, I plan to use any weakness or tests of support as entry into bullish positions on the S&P 500. I’d like to get in near 2,875 but we’ll see what the market says on Tuesday when trading resumes after the holiday.